Looking for the perfect mounting solutions for your Arlo Security Camera? Look no further than the Sully Suction for Camera Arlo and other devices with a 1/4" screw adaptor. MOUNT YOUR ARLO WITH NO SCREWS! This smart security arlo cam wall mount is fully adjustable, with 270° arm movement and a 360° RAM 1/4" Screw mount rotation. Your purchase will be backed by a 100% FULL MONEY-BACK GUARANTEE! Just click add to cart on this page to get yours NOW! [STRONG ARLO MOUNT SUCTION CUP] - The best Arlo Smart Camera Mount there is. The newest design that can extend the arm angle, suction lock handle PULLS DOWN instead of UP. This is a great Arlo Smart Home add on. Arlo Mount Outdoor Suction, use this mount to mount your Arlo Camera indoor or outdoor. 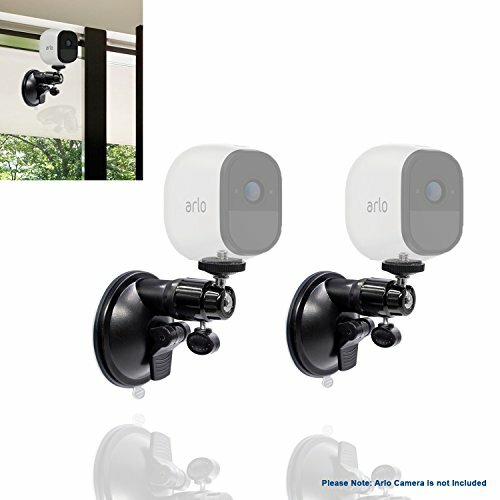 [FULL ROTATIONAL MOVEMENT] - this smart security arlo cam wall mount is fully adjustable, with 270° arm movement and a 360° RAM 1/4" Screw mount rotation. ★★[MAKE SURE TO PURCHASE FROM SULLY to get this best suction cup around!] - any other seller will not be selling a product that is reflected on this listing and reviews. If you have any questions about this product by Sully, contact us by completing and submitting the form below. If you are looking for a specif part number, please include it with your message.